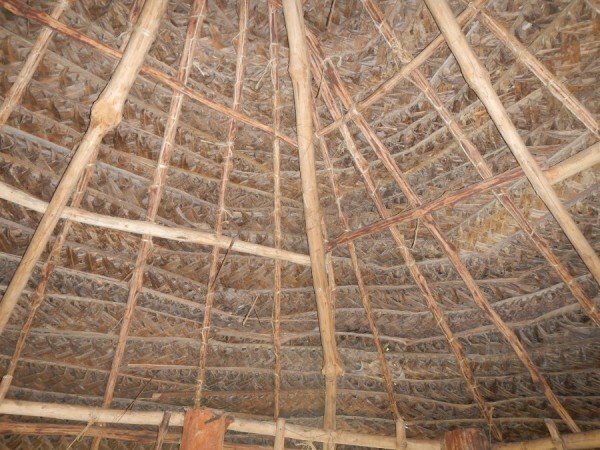 I’ll start with a coarser form of palm-weaving that is used to make houses. 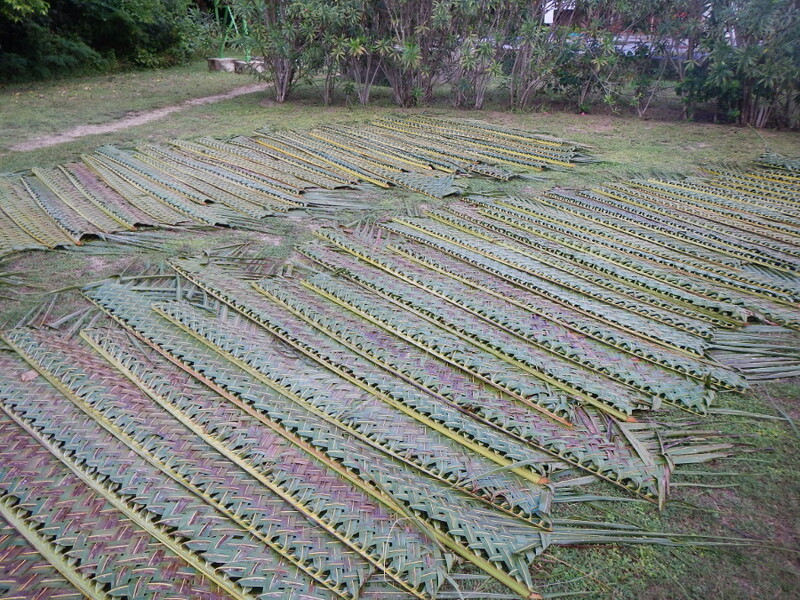 The palm-leaves below are drying in the sun. They have been plaited while still attached to their branch rather than cut off to make strands for finer weaving, because they’re going to be used for making houses. These have been plaited while they’re still supple, so they hold their shape when dry. 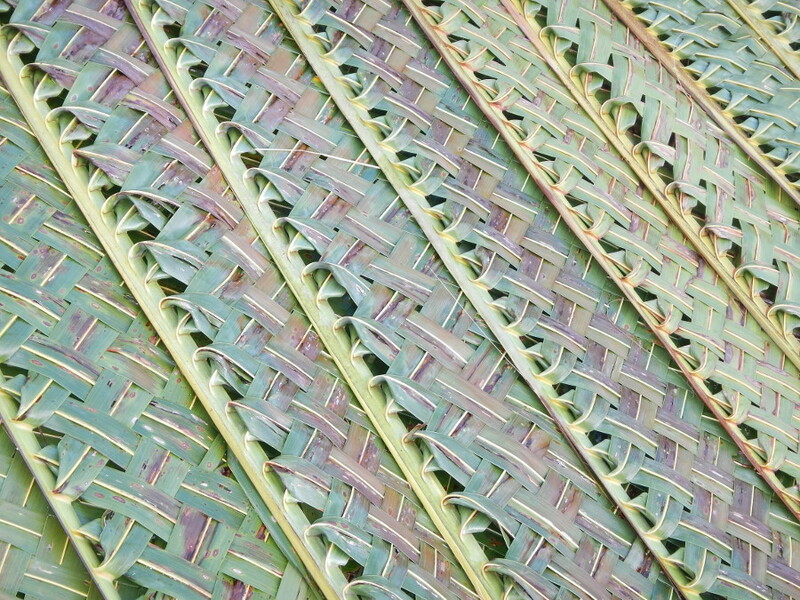 The woven Palm-leaf branches are used to make the walls and roofs of houses. They are wonderful to sleep in, because the breeze wafts in from the sea, keeping the air cool and the mosquitoes away. 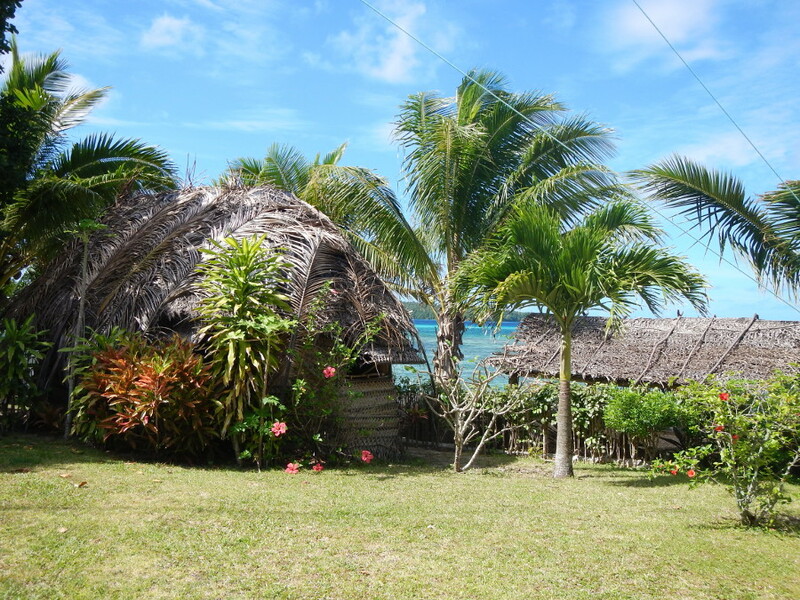 Here’s a little house, called a fale (pronounced fallay) that we stayed in on one of the Vava’u islands before the kayak trip, firstly looking from the outside. You can see some un-woven palm branches that have been laid over the top of the house, and you can see the woven palm fronds that make up the wall, tied to a wooden frame. Looking up into the roof you can see the woven branches in the roof, laid over each other and secured, and then covered with a layer of looser palm branches. Later in the trip we went on a village home-stay with a family up in the mountains in Fiji (we stayed in the green and pink house below). My brother and his son had stayed there some years ago and were made really welcome, so we asked if we could stay with the same family. 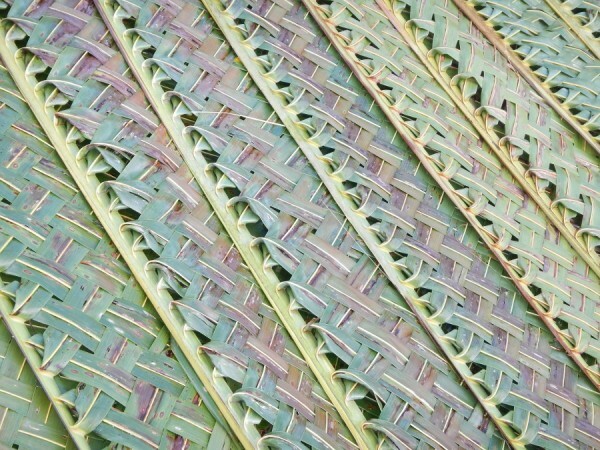 The palm-leaf weaving techniques in Fiji are similar to Tonga, although with local variations. The woven matting is used as floor-covering, and also doubles as something to sit on and also to sleep on. Here are four generations of our host family inside their house. It’s a far cry from the ‘tourist cocoon’ way of travelling. It was beyond our normal comfort zone, and was a totally eye-opening and happy experience. Communicating with no shared language was interesting (and possible!) and the children seemed to find us a very strange novelty! One thing was a real eye-opener. Having slept in the family’s house, shared their meals, drunk kava at village ceremonies and been invited for tea in neighbouring houses, we began to feel we kind of belonged. We understood who was who, and how the village worked. After a few days a bunch of white western European tourists came to the village and wandered around. They looked so fearful and suspicious, clutching their bags close to them as if someone was about to mug them. One of the young men who spoke English commented very sadly to us that they looked at him and his village as if they hated them. This is incomprehensible to a Fijian way of thinking, as strangers are all future friends. 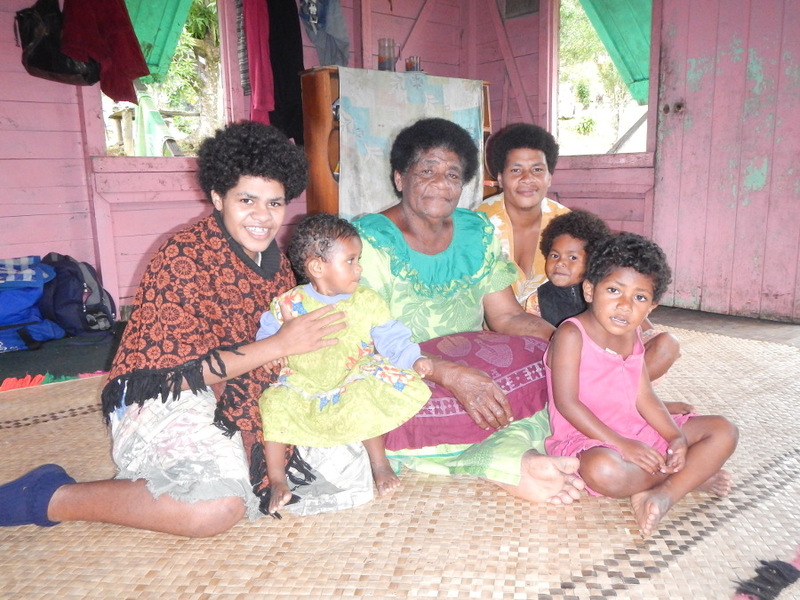 Meeting Tongan and Fijian people has completely changed my attitude to talking to strangers wherever I am. 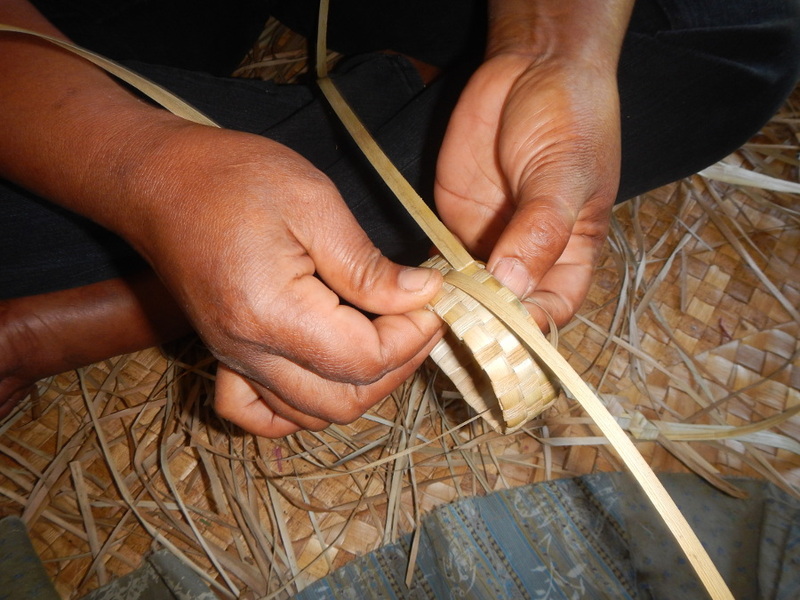 But back to the palm-leaf weaving. 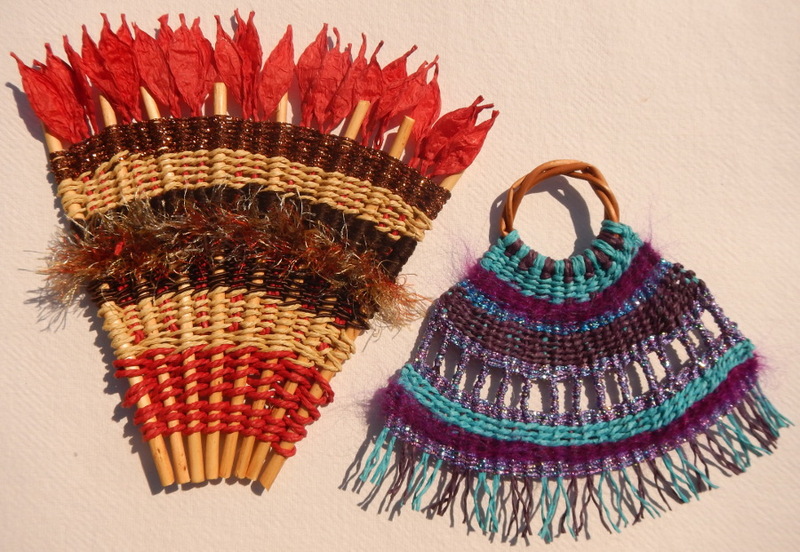 Here are some finer pieces of weaving, where the pattern has been added by weaving in a darker strand. 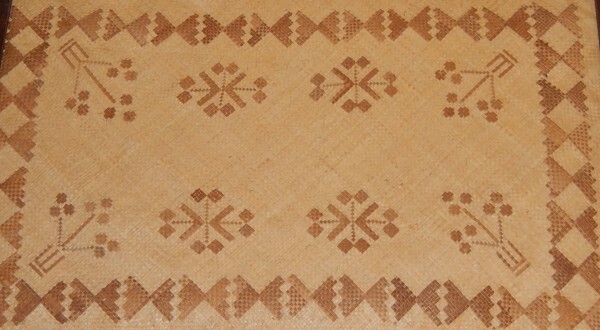 The patterns are different between Tonga and Fiji, and a local expert can identify each pattern as coming from a specific village. Decorative weaving is used to make a long rectangular strip that is worn by men and boys on formal occasions such as Church or village meetings, wrapped around the waist and hips, tied off with a piece of cloth. They look quite stiff and uncomfortable to wear, which kind of adds to the the formal posture and the ‘gravitas’ of the occasion. I’ll finish with a little tale. We were fully immersed in the village, enjoying learning about the traditional way of life. A life with no TV, computers, electricity or other mod cons, where everything is based on tradition. A young lad acted as our guide one day to go up the local mountain. He told us that he would become the village Chief later on in life. I asked if that meant that all the girls wanted to marry him. His answer was yes (with no hint of false modesty) but he added that he already knew who he was going to marry. I imagined that he would have been betrothed at a young age to a young girl selected as ‘suitable for a future Chief’s wife’, like generations before him. Then it became clear that his future wife was from a village on a completely separate island, and I couldn’t understand how they had met. It soon made sense… they met on Facebook! Coming from a Chief’s family, they had the only generator in the village so he was able to charge his mobile phone. The reason he was so keen to guide us up the mountain was that the top of the mountain is the only place he could get a mobile signal to get onto Facebook. Ha, that caught me out! This entry was posted in News and tagged fale, fiji, Palm leaf, tonga, village home-stay, weaving on September 17, 2015 by Jane. 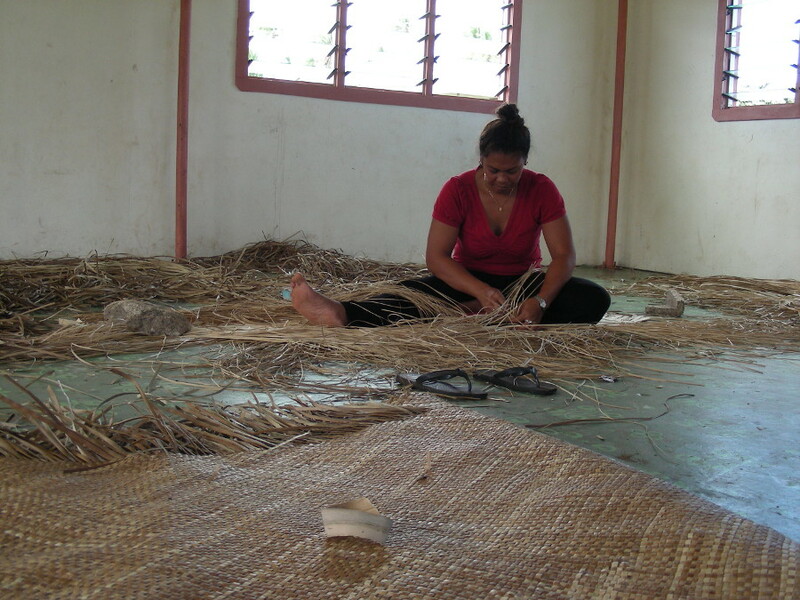 I promised to share some photos here of palm-leaf weaving in Tonga and Fiji. 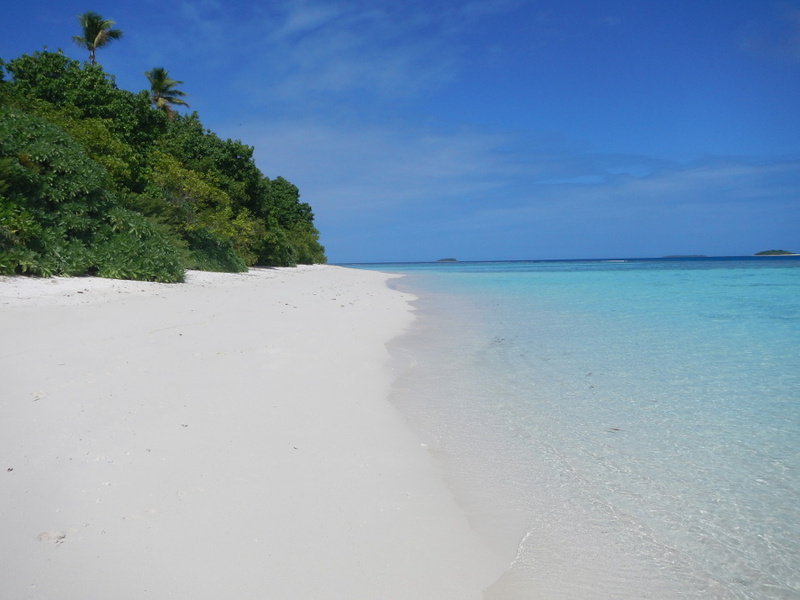 I was there the summer before last, on the trip of a lifetime based around a kayak-camping trip between some far remote Tongan islands. Memories of this were re-kindled a couple of weeks ago when I went on a twining course with Mary Crabb. 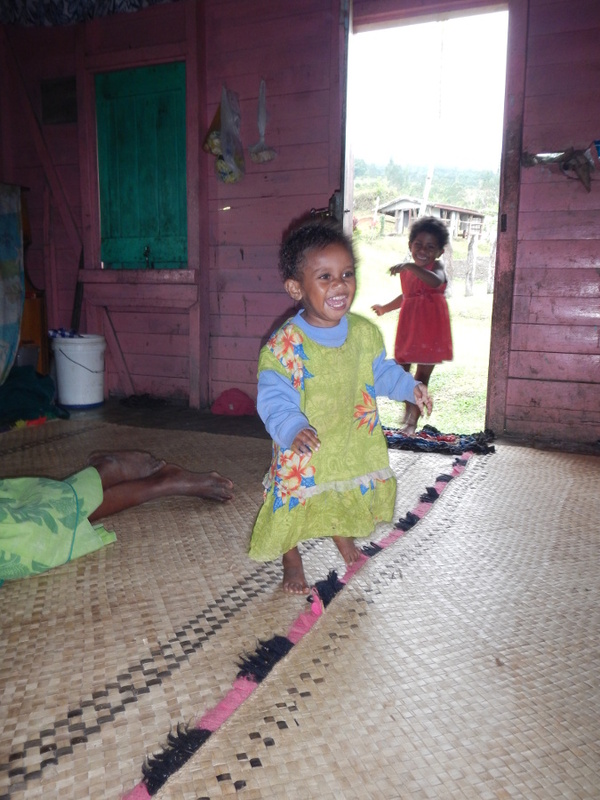 Pacific island culture is unbelievably friendly, more than anywhere else I’ve ever been to. 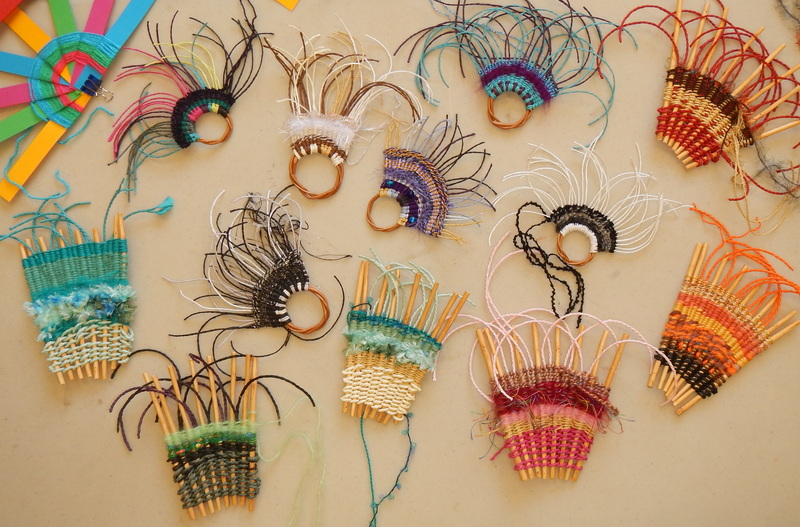 That makes it very easy to get chatting to people about their crafts, despite limited common language. It’s amazing how much you can communicate with signs and gestures, and before you know it you’re having a lesson. 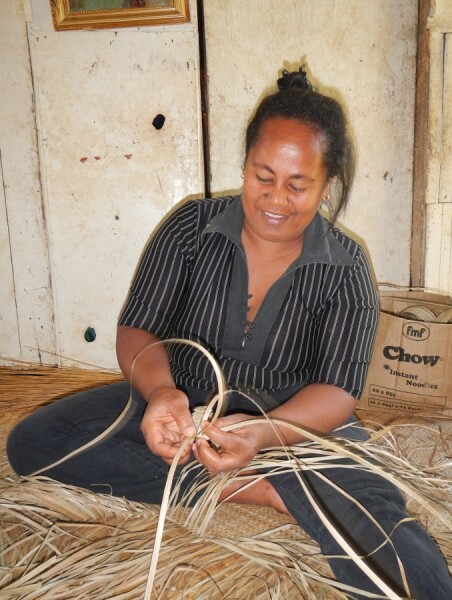 I had a lesson in palm-leaf braiding with this lovely lady, in her home on the island of Eua. She has prepared the palm-leaf fronds, firstly by drying them out in the sun for a couple of days. Then the wide fronds are ‘sliced’ down into narrower strands, by running a sharp piece of tin-can along the length of them. 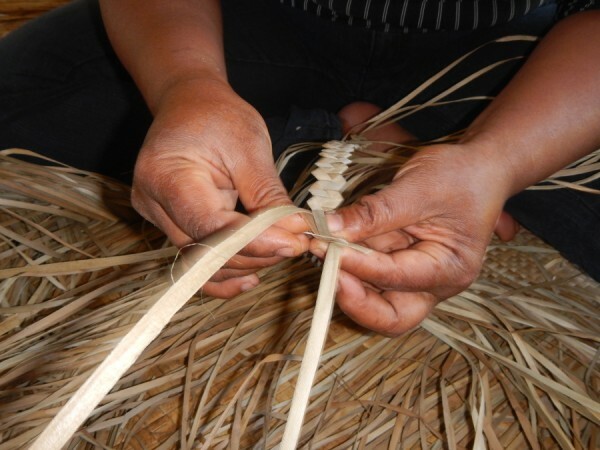 The fronds are quite tough and so they’re pretty hard on the hands, but they make very strong items once they’re woven. For the purposes of teaching, I was shown how to make a four-ply braid. 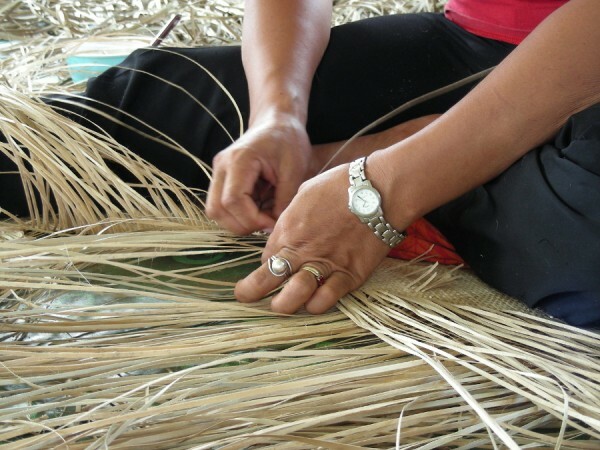 The same principle is used for weaving bigger things, and all sorts of decorative details are added. 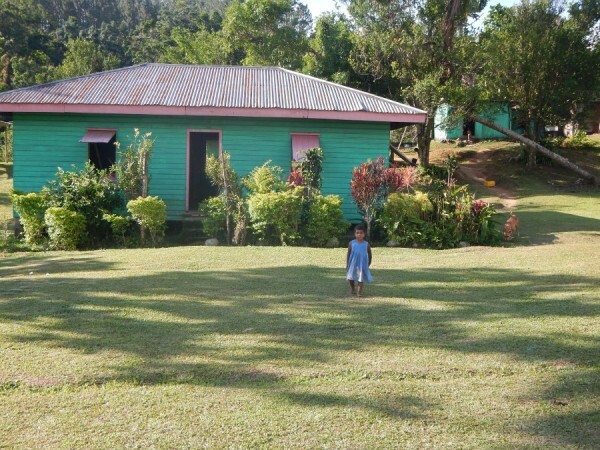 Life in Tonga moves at a much gentler pace than here in the UK. 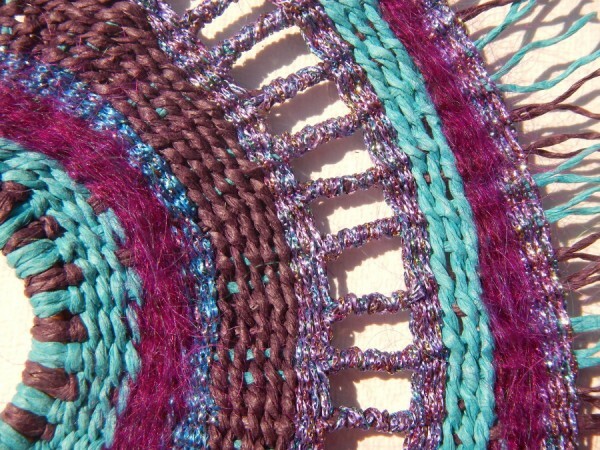 Weaving mats is a chance to sit and gossip with friends. I heard the most heavenly singing coming from this Church hall, and wandered in to find these women sitting weaving. They welcomed me in to sit with them while they worked and sang. 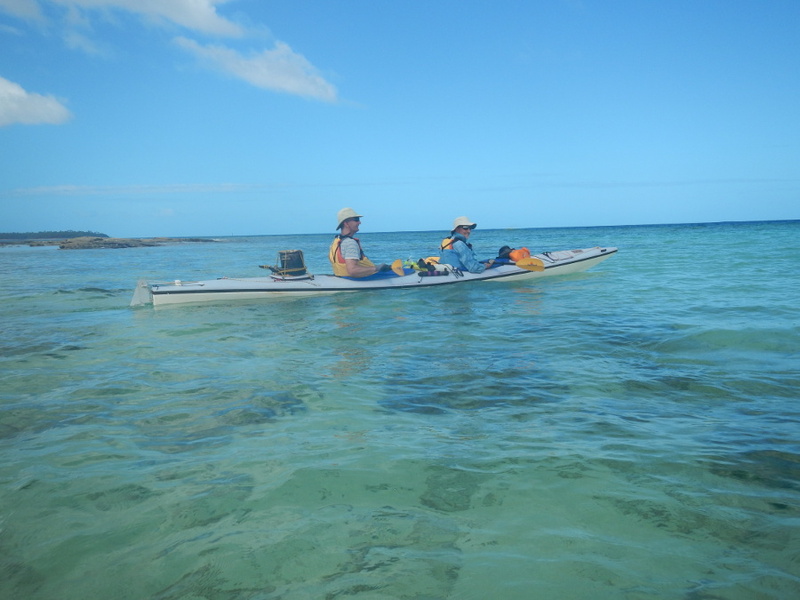 And in case you wondered how we got around in Tonga, here’s how. That’s my brother and husband in one of the kayaks, loaded with tents, water, cooking pot and frying pan. I’ll dig out some photos of how the woven items are used in daily life. Unfortunately for now time has run out, so I’ll include those in a later post. I do feel nostalgic for the experience of ‘timelessness’ in the Pacific. I don’t expect that people on the islands often say ‘I didn’t have time’. There always is time, if not today then tomorrow. This entry was posted in News and tagged fale, fiji, Palm leaf, tonga, village home-stay, weaving on July 1, 2015 by Jane. I’ve just finished two samples of twining, which I learned on a course with Mary Crabb at Worthing Museum and Art Gallery last weekend. Mary brought an enormous selection of threads and yarns – including some ‘special’ ones which she shared very generously with students. It was a sunny day so we had the door into the Museum garden open, and there was a calypso band playing outside for a private view for a new exhibition in the Studio Gallery. Lovely. The starting point for our work was looking at some of the antique fans in the Museum, in particular their colours and shapes. Twining is a technique that’s kind of a mixture between weaving, plaiting and braiding. 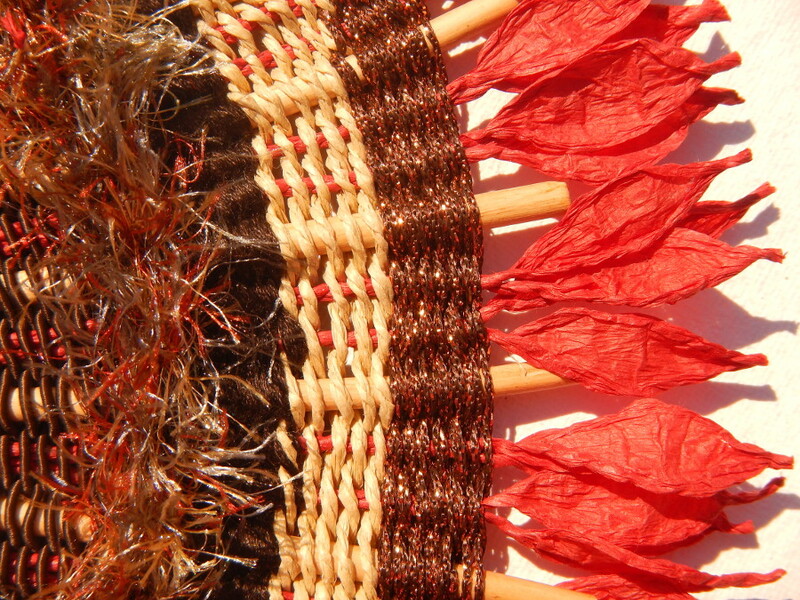 Rather than one strand running to and fro like weaving, two strands are worked at the same time, with a crossover twist round each of the uprights. This one was worked over willow, which gives a firm foundation. As the shape fans out, extra rolled paper uprights are added in between them so that the woven strands don’t have to span too much distance between them. 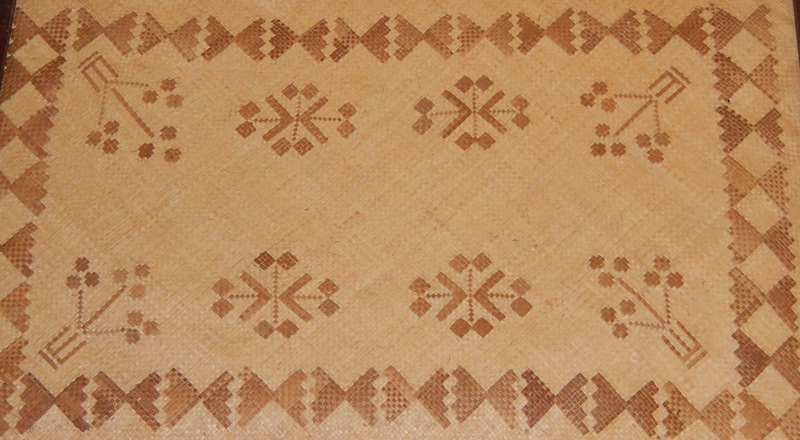 This one was woven on uprights made of rolled paper so it is slightly more flexible (depending on how tightly you weave it). The picture below is students work in progress during the day. 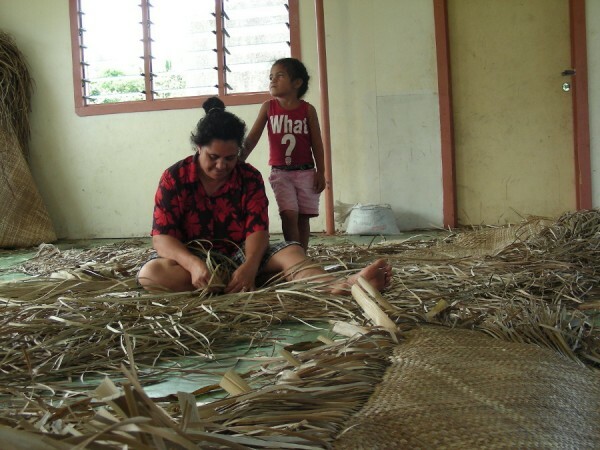 During the day we were chatting about different kinds of weaving / twining / basket-making / braiding / plaiting, and it brought back memories of learning how to weave with palm fronds last year when I was travelling in the Pacific. 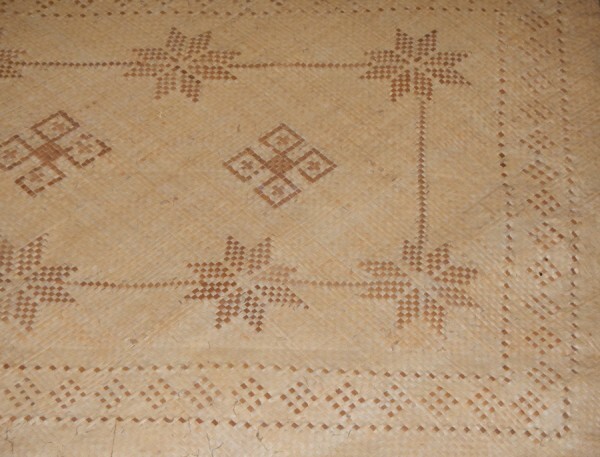 I’ll dig out some photos of palm frond weaving, and how they are used in Pacific island houses. I need abit more time to find those, so it will have to be ‘part two’ of this post. This entry was posted in News and tagged braiding, Mary Crabb, Mary Crabb Textile Basketry, plaiting, Twining, weaving, willow on June 11, 2015 by Jane.